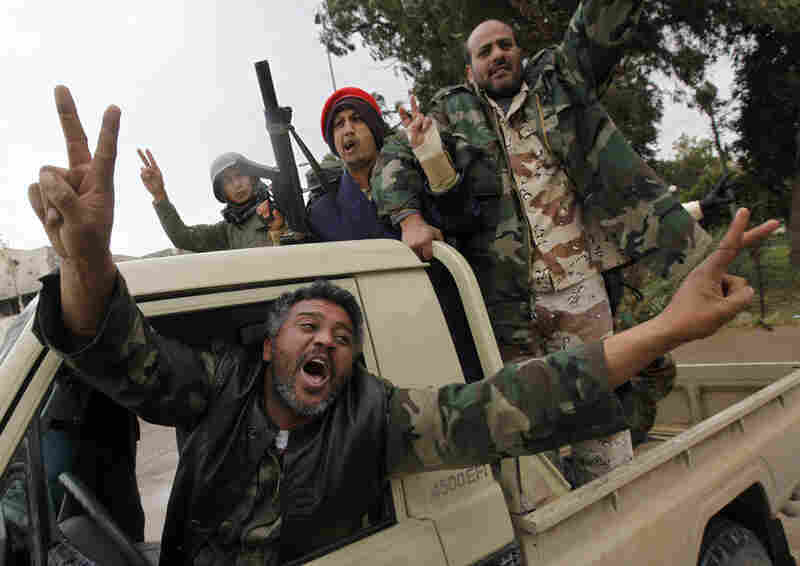 Libyan Rebels Close In On Tripoli Hundreds of rebel fighters with tanks and truck-mounted anti-aircraft guns occupied a city about 30 miles west of Tripoli and braced for a possible offensive by Gadhafi forces. In the east, opposition leaders announced a national council to serve as the face of the uprising. 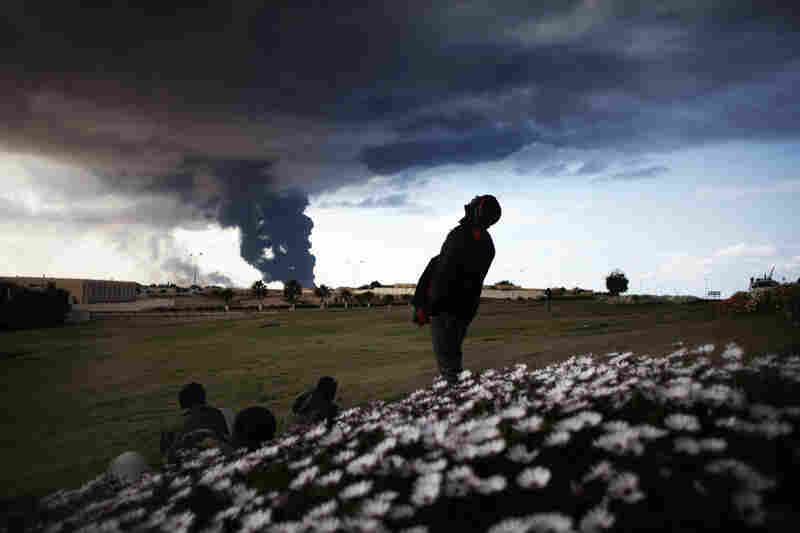 Libyan rebels watch smoke rising from an oil pipe just outside the town of Ras Lanuf, where many anti-regime fighters retreated after artillery and airstrikes from government troops Wednesday. Refugees who fled Libya bathe in the Choucha refugee camp, near the Tunisian border town of Ras Jdir on Tuesday. The Red Cross and the United Arab Emirates plan to build two new camps on Tunisia's border. An estimated 100,000 mainly foreign migrants have crossed from Libya into Tunisia since Feb. 20, Tunisian officials said. 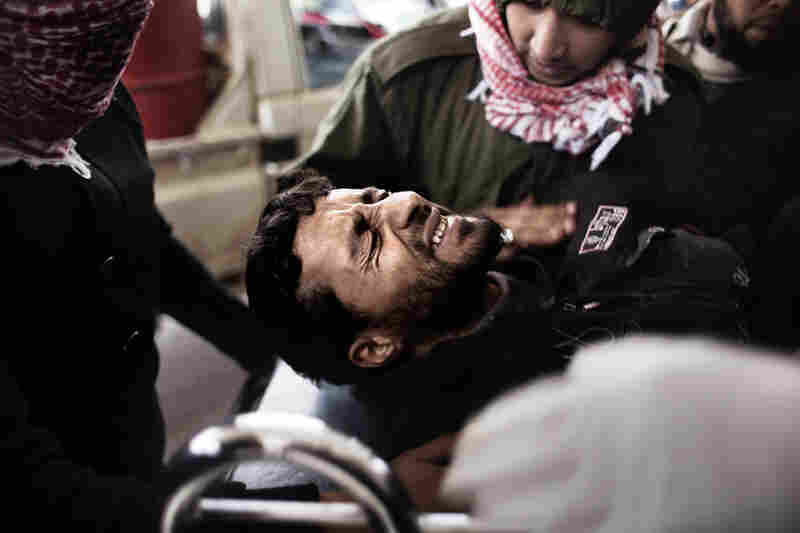 An injured rebel fighter is brought to a hospital in Ras Lanuf on Tuesday. Rebel fighters run for cover as an air force jet drops a bomb on the outskirts of the oil-rich town of Ras Lanuf on Tuesday. 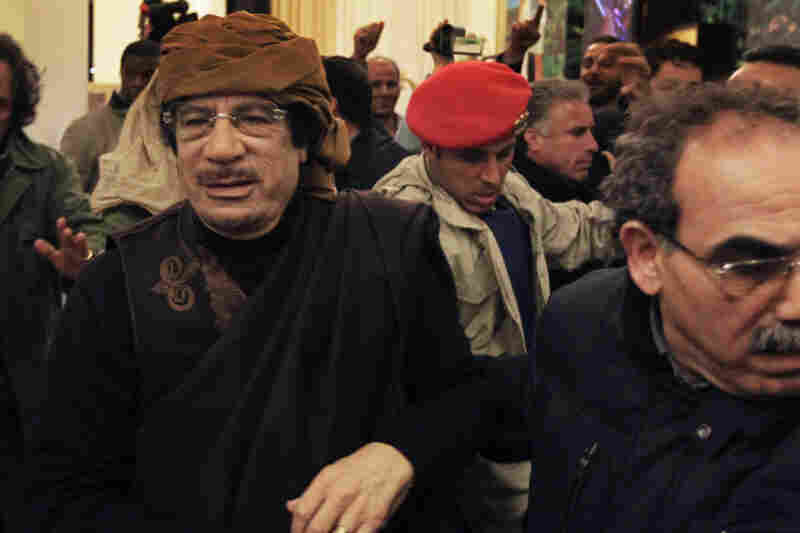 Libyan leader Moammar Gadhafi arrives at a hotel to give television interviews in Tripoli on Tuesday. 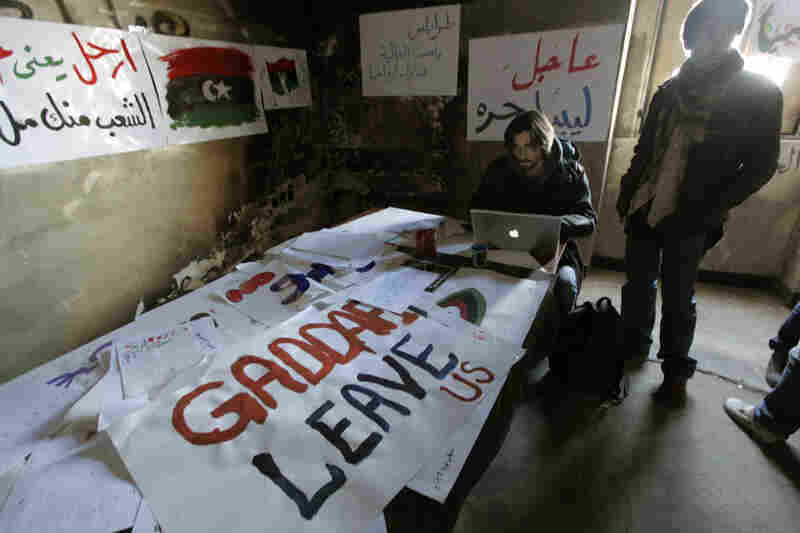 Volunteers work on anti-Gadhafi banners at the newly set-up media center in Benghazi, Libya, on Monday. 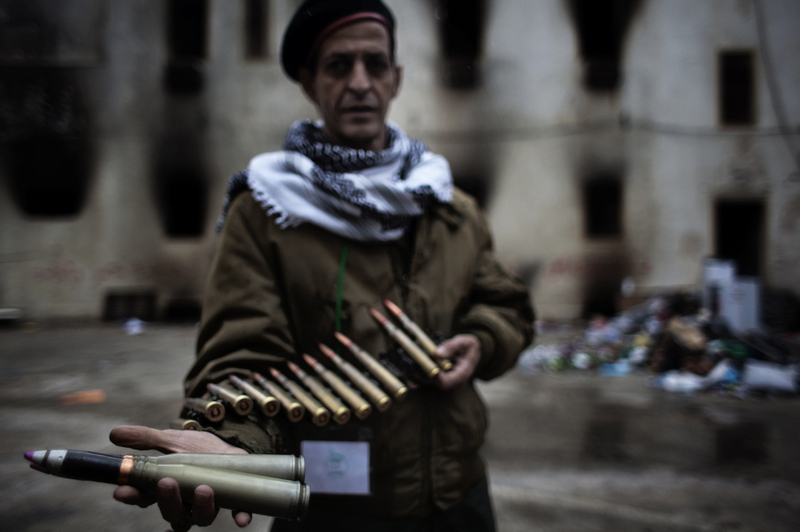 Libyan activists provide technical support and documents to journalists. 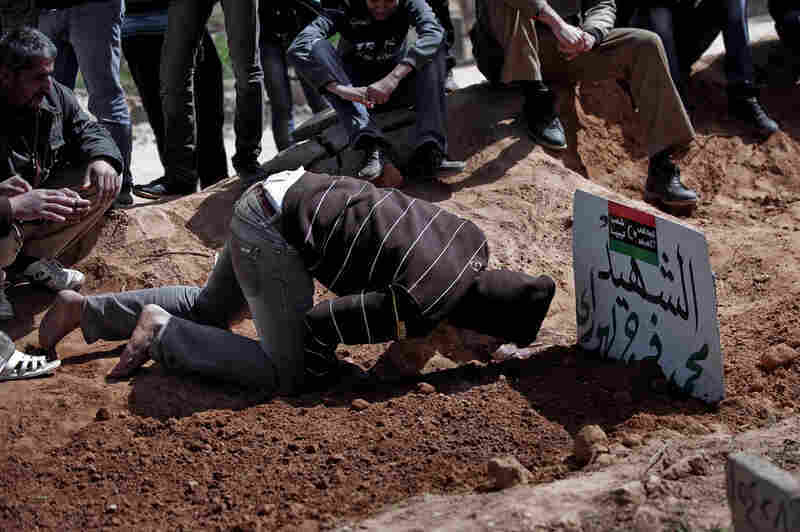 A mourner kneels over the grave of a relative recently killed in a battle between rebel fighters and forces loyal to Libyan leader Moammar Gadhafi for control over the town of Bin Jawad, Libya, on Monday. Rebel fighters take cover as a bomb dropped by an air force fighter jet explodes near a checkpoint on the outskirts of the oil town of Ras Lanuf, Libya. A rebel fighter shouts from his anti-aircraft machine gun position as he sees a fighter jet flying over at a checkpoint on the outskirts of Ras Lanuf on Sunday. 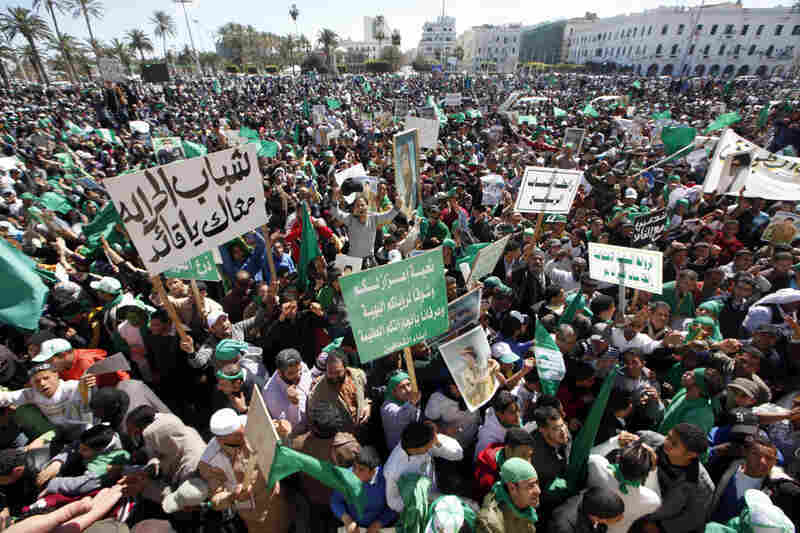 Thousands of pro-Gadahfi Libyans gather in Tripoli's Green Square on Sunday to celebrate victories over rebel forces. 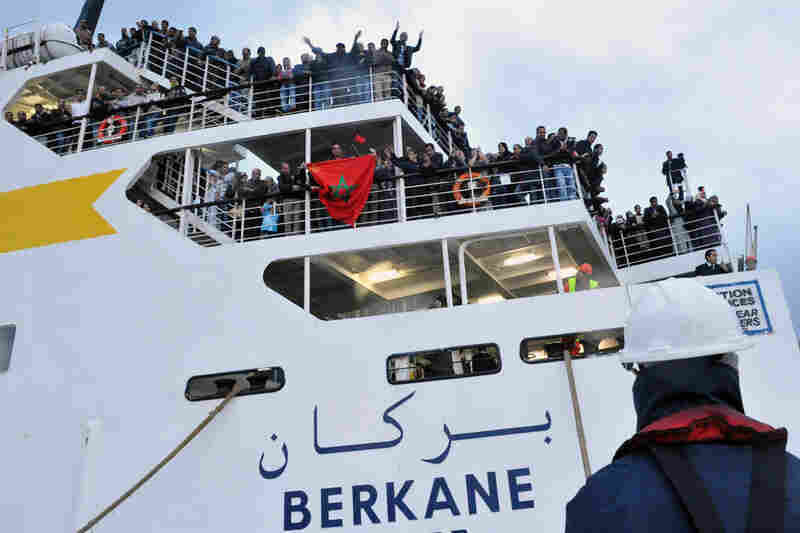 Moroccan expatriates arrive Sunday in the northern Moroccan port of Tangiers on a boat from the rebel-held city of Benghazi, Libya. Some 4,000 expats were repatriated by Moroccan authorities. A rebel fighter stands at a checkpoint Saturday in Ras Lanuf, where up to 10 people were killed and more than 20 wounded in clashes between opposition forces and Gadhafi loyalists. 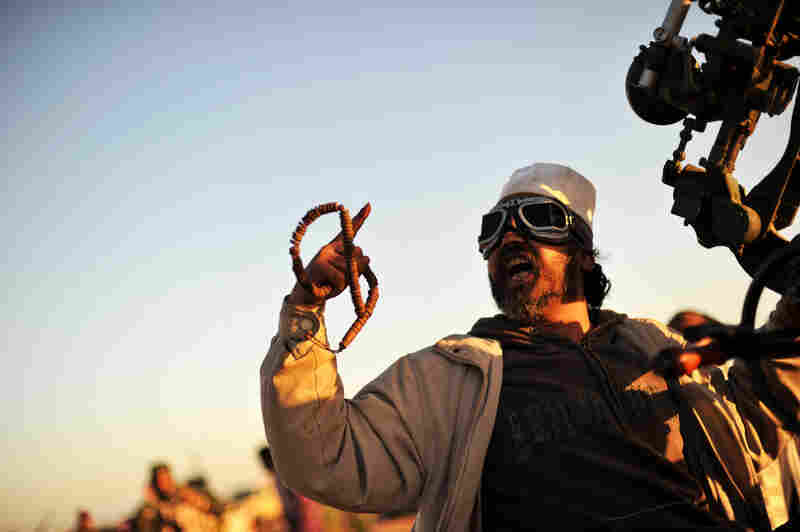 Libyan rebels gather for prayer on March 4. Loyalist forces have launched a fresh air strike on opposition territory in the east, while pumped-up opposition fighters pushed forward the frontline against Moammar Gadhafi's regime. 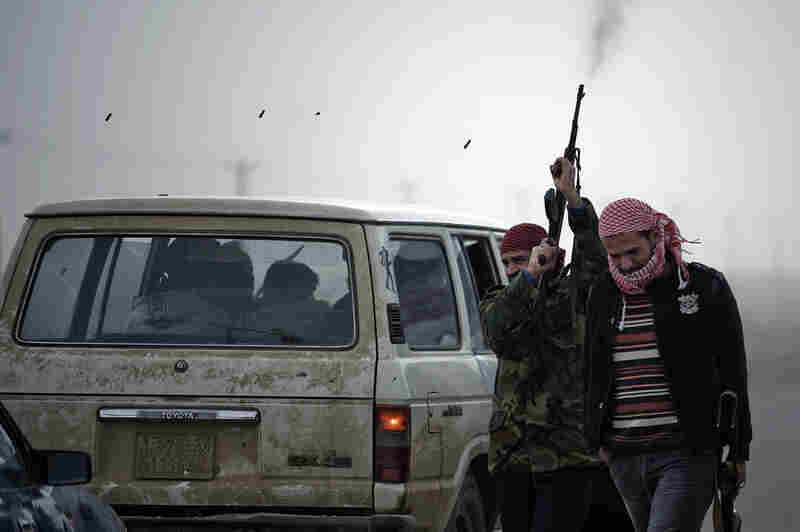 A Libyan rebel fighter fires his rifle in the air at Ajdabiya's west gate on Friday. Thousands of Bangladeshi refugees who fled Libya stand in a miles-long line as they walk to a refugee camp in Tunisia on Friday. 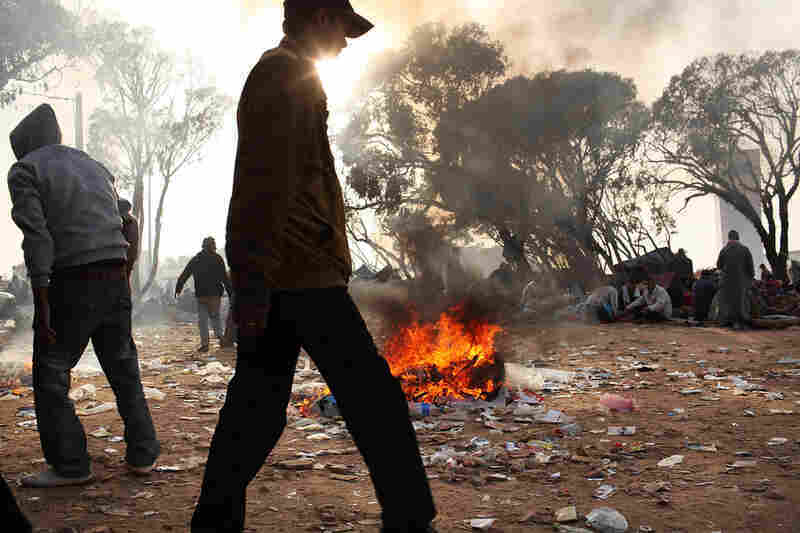 Trash fires burn at a border area in Tunisia on Thursday, where migrant workers from Libya are living in squalid conditions. Tunisia's situation is quickly turning into a humanitarian emergency as the country is overwhelmed with refugees. President Obama said on Thursday that he has authorized the use of U.S. military aircraft to move Egyptian refugees fleeing Libya to Tunisia. 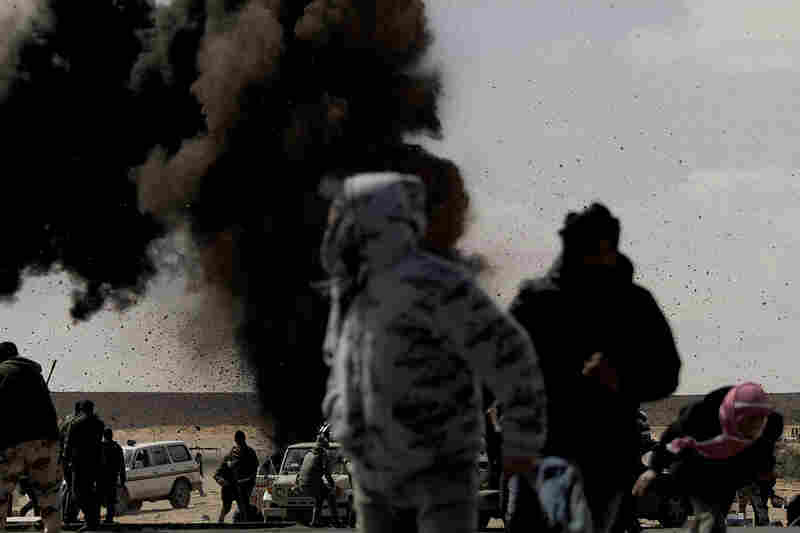 Libyan rebels in the northeastern city of Ajdabiya celebrate reports that the counterattacks led by Libyan leader Moammar Gadhafi have failed, on March 2. Thousands in Libya wait to cross into Tunisia via the Ras Jedir border crossing on Wednesday. 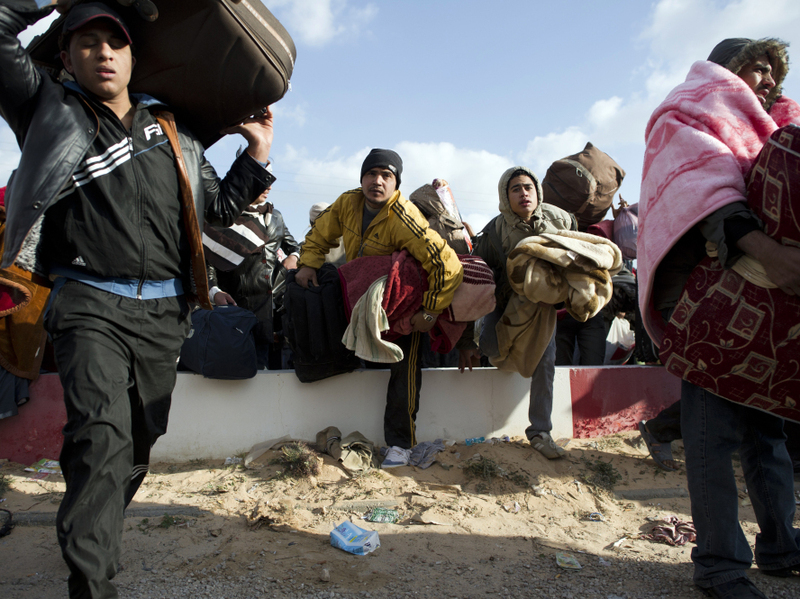 The UN refugees agency has made a plea to end the gridlock at the Tunisia border. Gadhafi drives away in an electric golf cart after speaking in Tripoli on Wednesday after addressing supporters and the media. 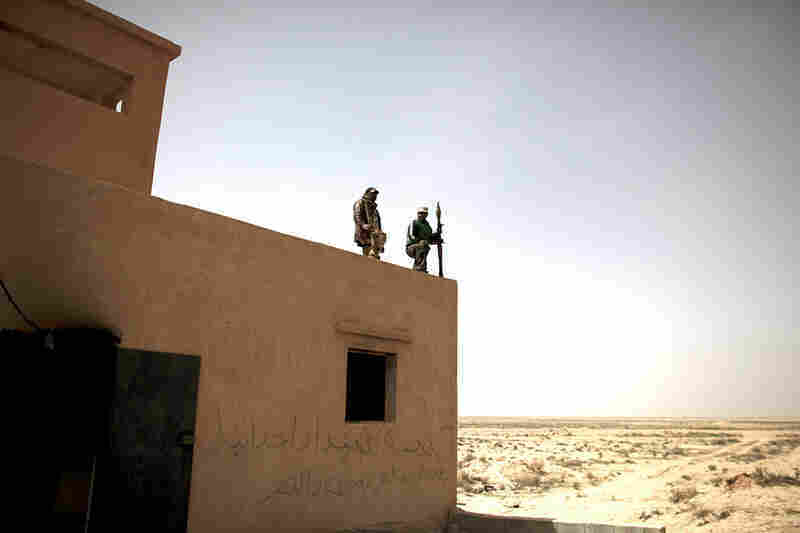 Defected Libyan soldiers stand guard outside an army base in the eastern town of Ajdabiya, Libya, on Tuesday. Eastern cities are free from government control, but fighting continues around the capital Tripoli, controlled by Libyan leader Moammar Gadhafi. 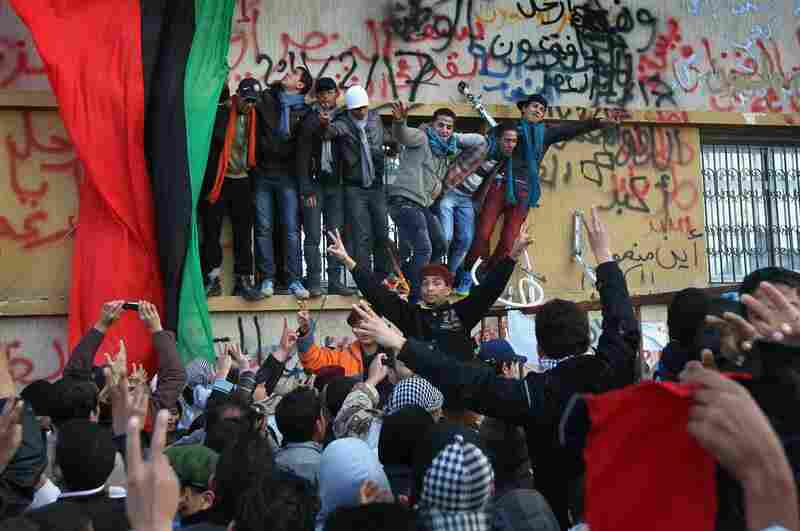 Rebels celebrate Sunday in the streets of Benghazi, no longer under the control of Gadhafi's government. A Libyan insurgent soldier displays heavy-caliber ammunition, allegedly intended to be used against civilians in Benghazi on Sunday. 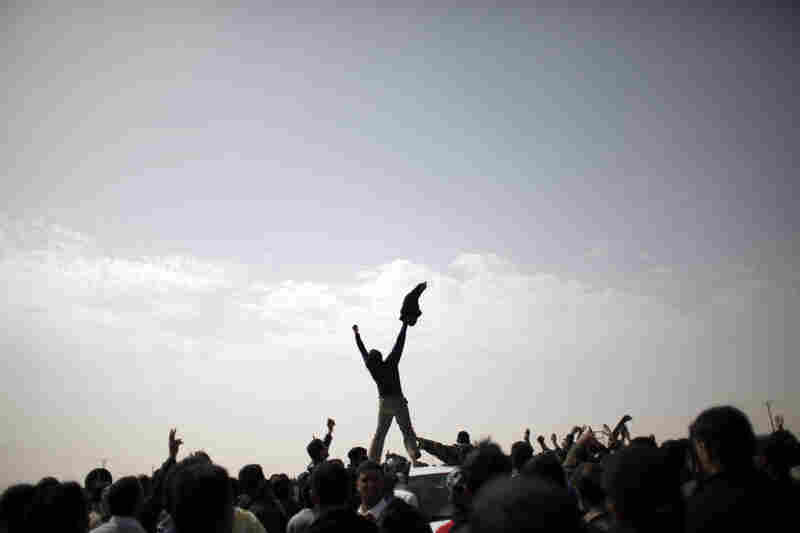 Crowds celebrate in Benghazi on Saturday, still demanding Gadhafi's removal from power. 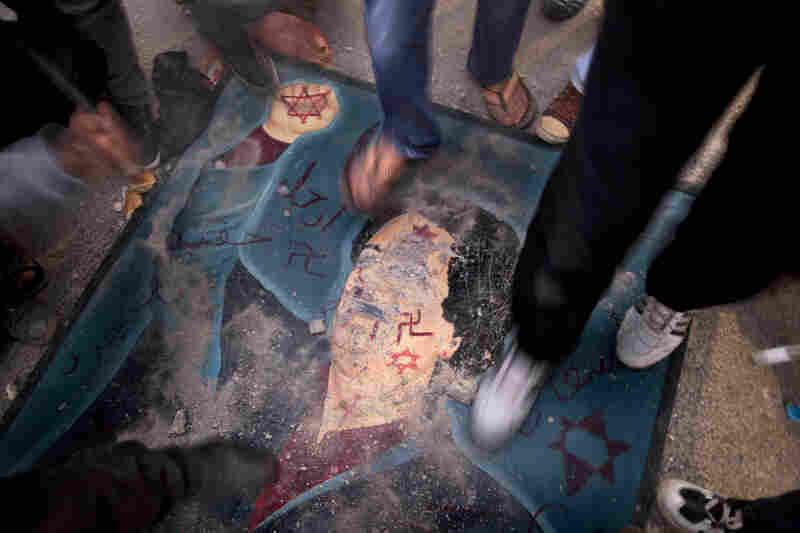 Libyans stomp on a defaced billboard of Gadhafi during a demonstration against his regime in the city of Tobruk on Saturday. 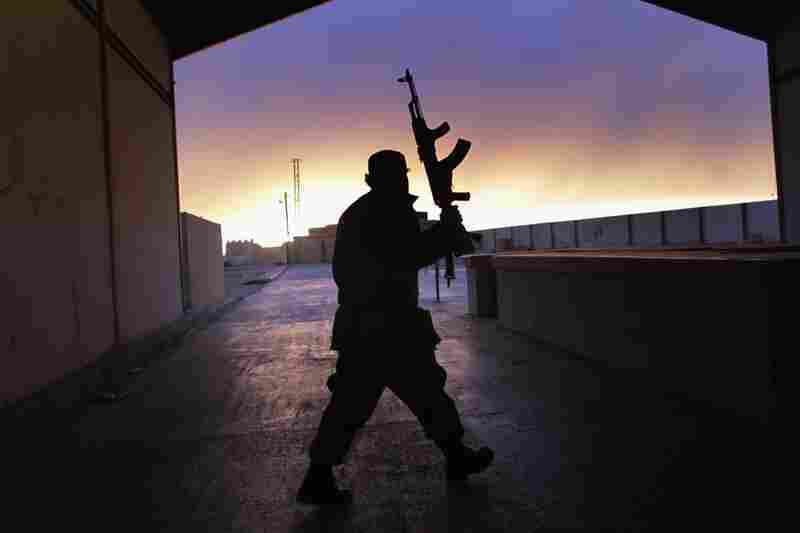 A Libyan border guard walks through an empty customs hall on the Libya-Egypt border on Thursday. Rebel forces in the city closest to Libya's capital braced for a possible counterattack by troops loyal to Moammar Gadhafi on Sunday, as opposition leaders in the east announced a national council to serve as the face of the uprising. Hundreds of opposition fighters with tanks and truck-mounted anti-aircraft guns occupied the center of Zawiya, about 30 miles west of the capital, Tripoli, according to The Associated Press. 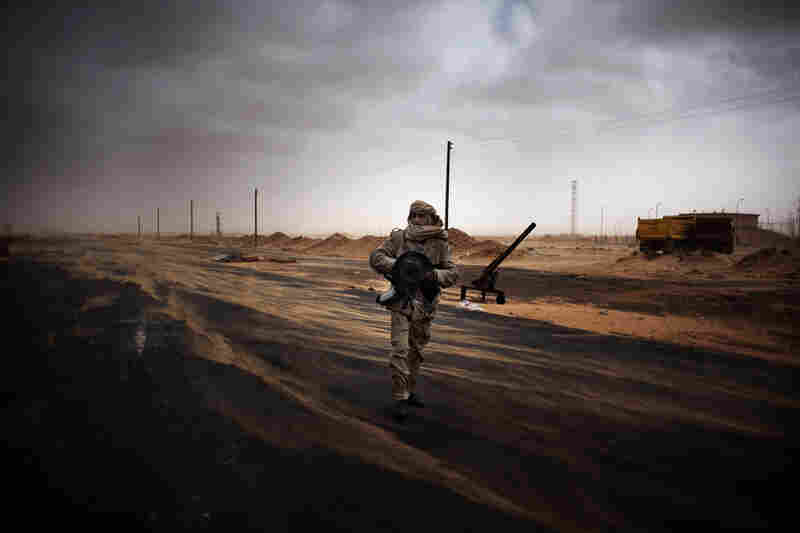 Gadhafi's forces were positioned on the outskirts of the city, which is close to an oil port and refineries. The tricolor flag of the former Libyan monarchy — now a symbol of revolution — flew from one of the bullet-riddled buildings in Zawiya. Hundreds of people chanted "Gadhafi out" and "Free, Free Libya." Many streets were blocked by palm tree trunks or metal barricades, and an effigy of the Libyan leader hung from a light pole in the main square with "Execute Gadhafi" emblazoned across its chest. There were at least six checkpoints controlled by troops loyal to Gadhafi on the road from Tripoli to Zawiya, the AP reported. Each checkpoint was reinforced by at least one tank, and the troops concealed their faces with scarves. Militiamen and pro-Gadhafi troops were repelled last week when they launched attacks trying to take back opposition-held territory in Zawiya and Misurata; the fighting killed at least 30 people. 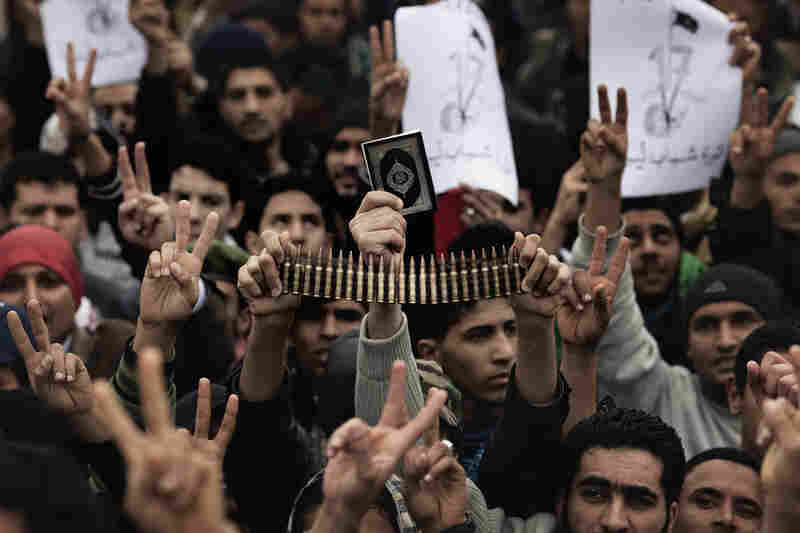 Gadhafi loyalists remain in control of the capital, Tripoli, which was reported to be quiet Sunday, with most stores closed and long lines outside the few banks and bakeries open for business. Traffic in the city was close to its normal level. Residents thronged Tripoli's banks Sunday after state TV announced that each family would receive $400 as well as credits for phone service and interest-free loans to buy apartments. A bloody government crackdown on the uprising that began nearly two weeks ago in the eastern city of Benghazi prompted the U.N. Security Council to slap sanctions on the regime Saturday. The resolution imposes a travel ban and foreign asset freeze on Gadhafi and his inner circle as well as a weapons embargo against the country. It also demands an immediate end to violence that it says may amount to crimes against humanity and refers the regime's crackdown on protesters to the International Criminal Court for possible prosecution. "The text sends a strong message that gross violations of basic human rights will not be tolerated and those responsible for grave crimes will be held accountable," U.N. Secretary-General Ban Ki-moon said after the unanimous vote by all 15 member nations. Ban visits the White House on Monday to talk about possible responses to Libya's deadly crackdown on protesters. NPR's Lourdes Garcia-Navarro said the vote is being met with a more muted response among anti-government protesters in the liberated east of Libya. They welcomed the U.N. action, but feel the international community didn't move until foreign nationals were evacuated out of the country. Protesters also made clear that they do not welcome foreign intervention in Libya. "They don't want to be rescued, they don't want any military intervention," Garcia-Navarro reported from Benghazi. "They have done this themselves, they say, and they will get rid of Moammar Gadhafi finally themselves, as well." A number of former top aides have deserted Gadhafi since the uprising began 11 days ago, and even the Libyan dictator's Ukrainian nurse reportedly plans to flee the violence and return home. Halyna Kolotnytska, 38, is joining senior government officials, diplomats and pilots who have left Gadhafi's inner circle, according to Ukrainian newspaper reports citing Kolotnytska's daughter Tetyana. As Gadhafi's control over the country dwindles, opposition leaders on Sunday appointed a former justice minister who defected in the early days of the uprising to head a national council. Mustafa Abdel-Jalil was chosen by the committees running the eastern Libyan cities now in the rebellion's hands, according to Benghazi city council member Fathi Baja. "It's a symbol here, people say, of the fact that they will never acquiesce to be under Gadhafi's rule," Garcia-Navarro said in Benghazi, which rebels have described as the capital of "Free Libya." 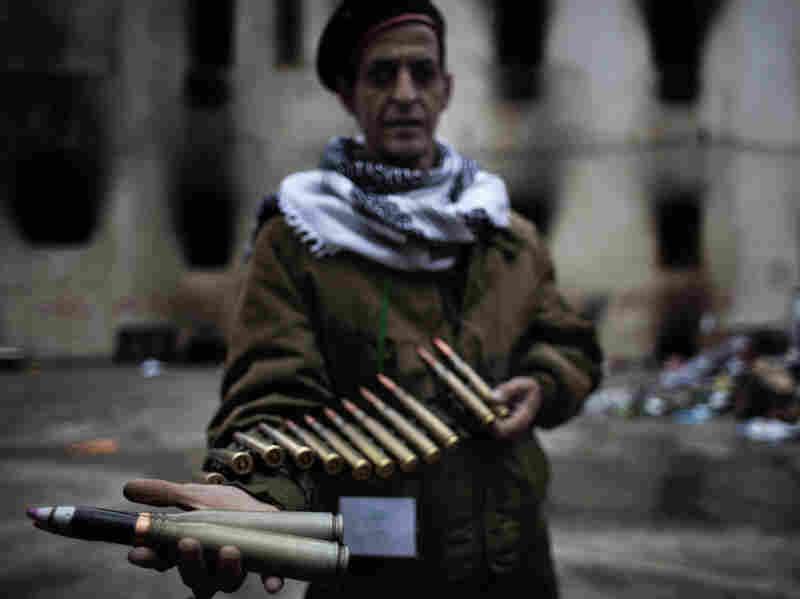 A Libyan rebel fighter displays heavy caliber ammunition found at a military barracks in Benghazi on Sunday. Abdel-Jalil, who resigned last week, has accused Gadhafi of ordering the 1988 bombing of the Pan Am flight that killed 270 people, mostly Americans, over Lockerbie, Scotland. The bomber, Abdel Baset al-Megrahi, was released from prison amid controversy and returned to Tripoli in August 2009 on the grounds that he was suffering from prostate cancer and would die soon. In an interview with The Sunday Times of London, Abdel-Jalil said the bomber threatened to provide evidence that Gadhafi masterminded the bombing and blackmailed the Libyan leader into securing his release. Gadhafi plowed $80,000 a month into a fund that paid for legal fees, lobbying and family visits to the prison, according to the Times report. Secretary of State Hillary Clinton said Sunday that the U.S. is "reaching out" to Libyans trying to organize a post-Moammar Gadhafi government and is "ready and prepared to offer any type of assistance." "We are just at the beginning of what will follow Gadhafi," Clinton told reporters en route to a U.N. meeting in Geneva. Britain revoked diplomatic immunity for Gadhafi and members of his family, and Italy's suspended a treaty with Libya that includes a nonaggression clause — removing a possible obstacle to Rome taking part in any peacekeeping operations in Libya or allowing the use of its military bases. Italian Foreign Minister Franco Frattini said Sunday that "de facto suspension of this treaty, even without declaring it, is already a reality." He said that when there is no government infrastructure, as is the case now in Libya, a treaty is suspended. 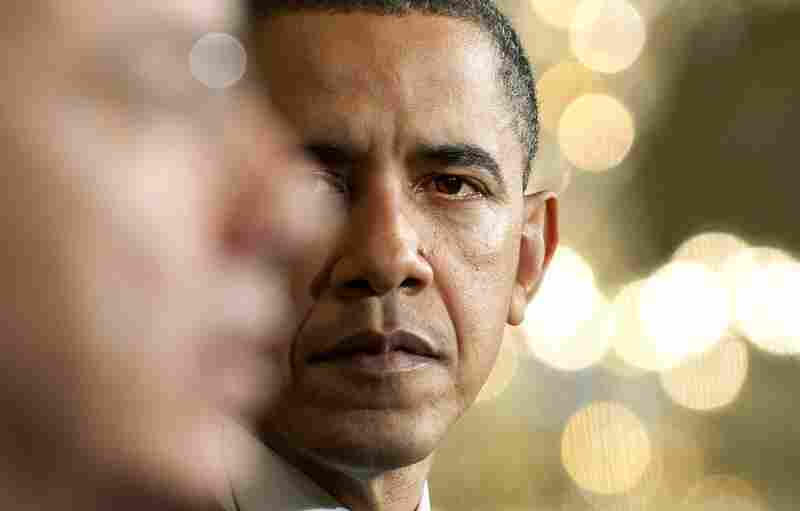 President Obama said Saturday for the first time that Gadhafi should step down. "When a leader's only means of staying in power is to use mass violence against his own people, he has lost the legitimacy to rule and needs to do what is right for his country by leaving now,'' the White House said in a statement, summarizing a telephone conversation between Obama and German Chancellor Angela Merkel. Clinton said the U.S. is revoking visas for senior Libyan officials and their immediate family members and that future applications from those blacklisted for travel to the United States would be rejected. The U.S. tone shifted sharply on Friday after Americans in Libya were evacuated from the country by ferry and a chartered airplane. Egyptian people fleeing Libya race to get on buses at the Ras Jedir border post, near the Tunisian city of Ben Guerdane, on Sunday. 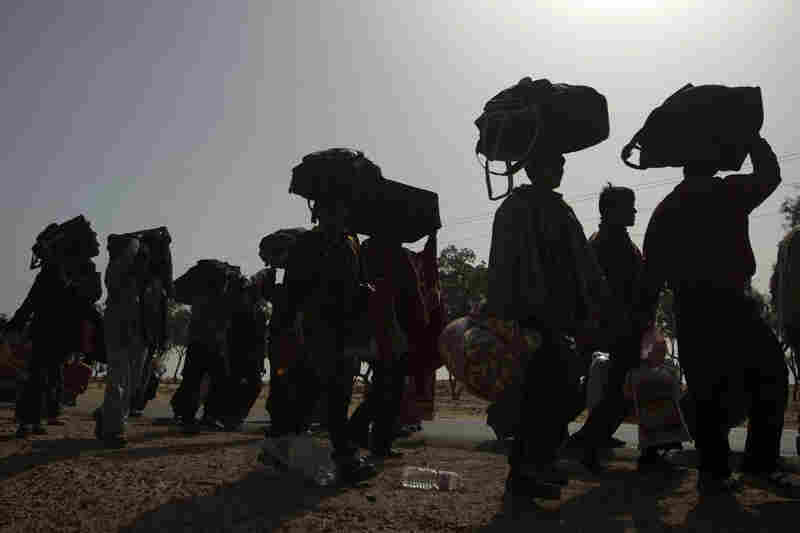 The U.N. High Commissioner for Refugees reported Sunday that about 100,000 people, mostly foreign migrant workers, have fled over Libya's borders into neighboring Tunisia and Egypt in the past week — creating a growing humanitarian crisis. "We call upon the international community to respond quickly and generously to enable these governments to cope with this humanitarian emergency," U.N. High Commissioner for Refugees Antonio Guterres said. The agency has begun to airlift relief supplies to Tunisia for the refugees at the border. 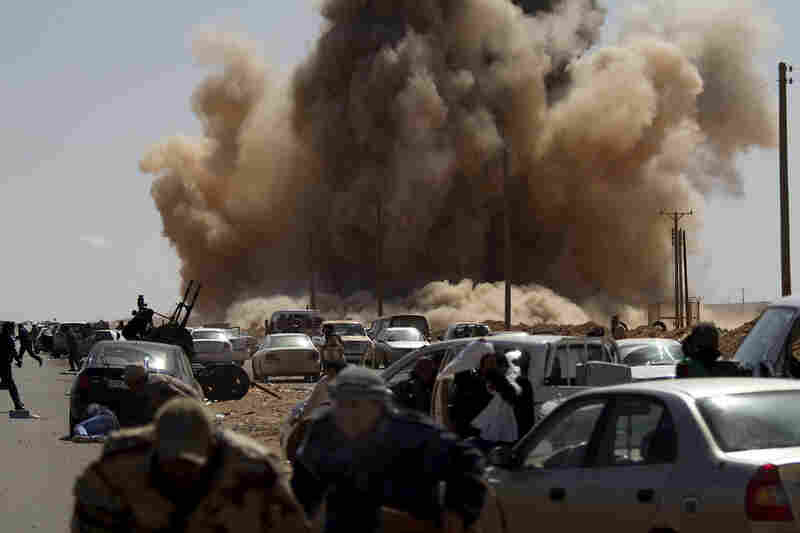 Western nationals have scrambled to get out of Libya as the level of chaos continues to rise. Germany's foreign minister said the country's air force has rescued 132 people during a secret military mission involving two German military planes that landed on an undisclosed runway in the Libyan desert. Meanwhile for the second day in a row, Britain sent military aircraft into Libya to evacuate civilians. Three Royal Air Force planes landed in the eastern Libyan desert Sunday and picked up 150 civilians, mostly British nationals. British Special Forces picked up another 150 oil workers on Saturday. But NPR's Garcia-Navarro reports that others in Benghazi haven't been as fortunate. "There are people who have been left behind, citizens of poorer countries who simply haven't been able to get a boat out of here," she said. "I'm talking about Bangladeshis, Somalis, and I'm also talking about sub-Saharan Africans." Tens of thousands of foreigners in Libya work at oil installations and construction companies, and many of them are sub-Saharan Africans. Some left stranded in Benghazi said they have been targets of violence because people believed that they were mercenaries sent in by Gadhafi to quell the unrest in the east. "They tell terrifying stories of having to hide in the desert to avoid beatings and even killings," Garcia-Navarro said. A number of Bangladeshis had traveled to the Egyptian border city of Tobruk in open-air trucks in hopes of getting out of Libya but were stuck there. One of the men told NPR's Jason Beaubien that he just wants to go back to Bangladesh, that his life is more important than actually earning money in Libya. "It was so dangerous and so difficult," the man said. "Some people were shooting and bombing. Simple people have guns, have bombs, and they haven't any protection, haven't any law, haven't any things." Tunisia's embattled prime minister said Sunday that he will resign, bowing to a key demand of protesters after at least five people died in a groundswell of new unrest in this North African country. Mohamed Ghannouchi, 69, was seen as a holdover from the old regime by Tunisians behind the so-called Jasmine Revolution that toppled autocratic President Zine El Abidine Ben Ali a month ago. Tunisia was the first Arab country to rise up in revolt against its rulers. "I am not ready to be the man of repression, and I will never be," Ghannouchi said in an appearance on state television. He did not say when his resignation would take effect. He warned that unspecified forces appeared to be swelling to try to quash the move toward democracy, saying, "There are signs that a plot is being hatched to cause the revolution to fail." Riot police in Oman clashed with pro-democracy protesters Sunday, killing at least one in a sharp escalation of tensions in the tightly ruled Persian Gulf nation. Witnesses told the AP that police fired tear gas and rubber bullets at protesters in Sohar, about 120 miles northwest of the capital, Muscat. The deadly clash marked the second day of protests and suggests that a government shake-up by Oman's ruler on Saturday failed to quell the tensions. Thousands of people in Bahrain rallied peacefully in the capital city's streets Sunday, rejecting the monarchy's appeals for talks to end a nearly two-week uprising in the tiny island nation. At least three processions paralyzed parts of the capital, Manama, and appeared to reflect a growing defiance of calls by Bahrain's rulers to hold talks to ease the increasingly bitter showdown in the strategic island nation, home to the U.S. Navy's 5th Fleet. "No dialogue until the regime is gone," marchers chanted as they moved through the highly protected zone of embassies and diplomatic compounds. NPR's Deborah Amos reported from Pearl Roundabout, which has been that heart of the demonstrations, that people were headed to the office of the prime minister to demand his resignation. Protesters shouted slogans against King Hamad bin Isa Al-Khalifa plastered fences with flyers denouncing security forces for attacks that have killed seven people since the first protests Feb. 14 inspired by revolts in Tunisia and Egypt. With reporting from NPR's Lourdes Garcia-Navarro in Benghazi, Libya; Jason Beaubien in Tobruk, Libya; Deborah Amos in Manama, Bahrain; Larry Miller in London; Tom Gjelten in Tunis, Tunisia; Sylvia Poggioli in Rome; and Linda Fasulo in New York. This story contains material from The Associated Press.